Joan Baez bought her first guitar at age 15. By the time she turned 20, she had committed at least two acts of civil disobedience, played the Newport Folk Festival twice, had concerts at the 92nd Street Y and Town Hall in New York City, and released her 1960 debut album, Joan Baez, to critical acclaim, cementing her rep as the leading female voice in folk music. In just five short years, Joan Baez became the Joan Baez: a young woman who seemed to arrive on the scene almost fully formed as both an artist and an activist. 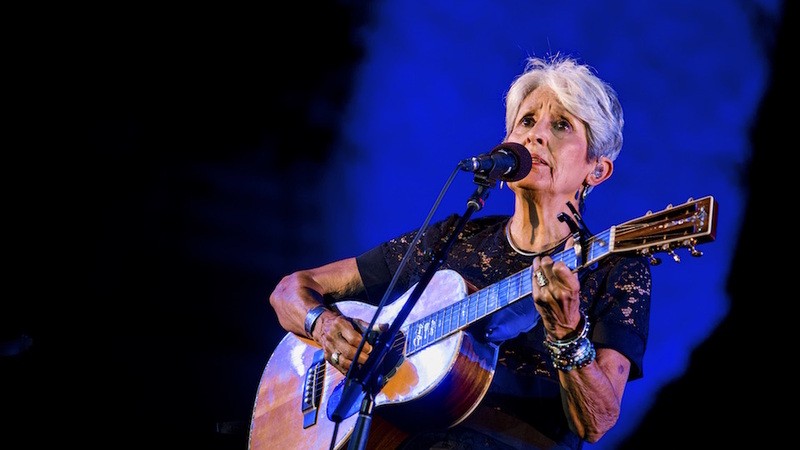 Her future lover and collaborator Bob Dylan got labeled “the voice of a generation,” but Joan Baez has always had something to say even before she first picked up a guitar as a socially-conscious California teen. The music simply gave her another outlet for her distinct and passionate voice. But it was through music that America first became acquainted with Baez and her crystalline soprano. “Her voice was like that of a siren from off some Greek island,” Dylan said recently in an interview for his website, “just the sound of it could put you into a spell. She was an enchantress.” Armed with just that enchanting voice, two guitars, and a handful of folk songs she arranged herself, Baez recorded her self-titled debut in four days in a NYC hotel ballroom. The resulting album, Joan Baez, is a gorgeous and haunting piece of Americana that doubles as an impressively assured debut from a then 19-year-old singer. And now, thanks to a pristine vinyl and digital re-issue from Craft Recordings earlier this year, Baez’s landmark album can be enjoyed by a new generation. Added to the Grammy Hall of Fame in 2011 and the National Recording Registry at the Library of Congress in 2015, Joan Baez is unquestionably one of the most historically and culturally significant recordings of the 20th century. It’s also significant because of who is singing these old, traditionally American folk songs: a woman of color. Born to a Mexican father and Scottish mother, Baez is as much a result of the “Great American Melting Pot” as anyone and that heritage has often made her the target of racial slurs. Yet Joan Baez garnered the young artist instant acclaim in a deeply divided country, and three gold albums later, she graced the cover of TIME magazine in 1962 thanks to her massive popularity. Given the current cultural climate in 2018, it feels particularly poignant that a woman of color named Baez became one of the most prominent voices of the American folk revival; a movement that was, with the exception of Baez and singer-musician/activist Odetta Holmes, predominantly white and male. Simply by adding their distinct voices to the folk music landscape, both Baez and Holmes (along with black male artists Harry Belafonte and Josh White) claimed the American experience as one belonging to anyone and everyone. It’s not for nothing Baez was invited to sing alongside Martin Luther King, Jr. at the March on Washington in 1963 — a moment when her activism and art alchemically collided. Her voice was a perfect vehicle for a movement committed to changing the conversation about race, American identity, and civil rights. Hers is a voice we still desperately need today. But after almost six decades, Baez is saying farewell — at least to the musical part of her career. The folk legend embarked on her Fare Thee Well Tour in September to promote her final album Whistle Down the Wind. Though Baez hasn’t totally ruled out performing altogether, she no longer plans to record new music or tour once she plays her last show in Port Chester, New York, in May 2019. Still, it would be unwise to think that because she’s putting the guitar away, she’s no longer using her voice. Joan Baez still has something to say. She’s just opting for other ways of doing it.